Does any one need any parts for one? Long time reader and commenter John has one that looks to be in good shape that he is willing to part with or part out. I had three of these units in Harrisburg and my recollection is they were pretty solid units. When tuned properly, they were low noise and sounded good on the air. The one issue I had was with the small 100 pf pass through/by pass capacitors in the IPA. Several went bad and were no longer functioning as bypass caps. The result was the transmitter would self oscillate. I think there were seven or eight of them and I replaced them all at once. 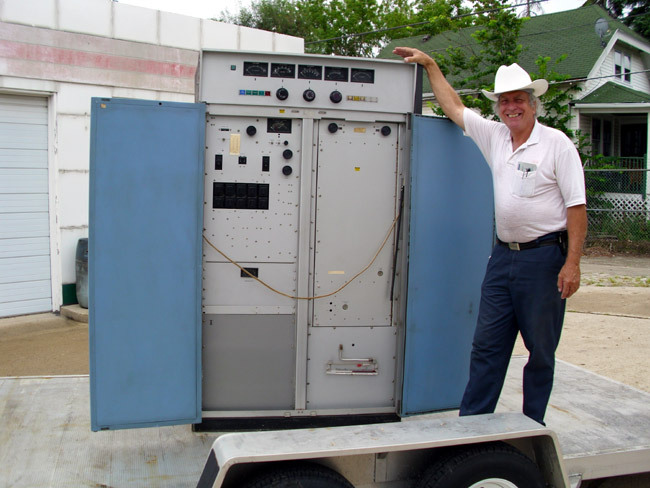 The exact model of that particular transmitter was a BTF-20ES1, which was one of the last FM transmitters off of the factory floor before the broadcast division went under. If anyone needs parts out there, I will probably cannibalize this unit as I have just too many. The separate power supply is inside the garage along with the latest version of the harmonic filter entirely made of copper. I don’t know if the entire unit actually runs or if it is parts only. It certainly looks like a clean unit. As I recall, Comark bought out all the RCA broadcast parts and service. Comark was then sold to Thomcast, which was sold to Thales which I think spun off it’s transmitter division to Grass Valley Group. Grass Valley started by making TV master control switchers, routers and other video equipment. Anyway, if you are looking for RCA parts for FM transmitters, contact me, I’ll put you in touch with John.